Iranian Navy commander claims the country will send a fleet of warships to the Atlantic Ocean to show its "prowess". 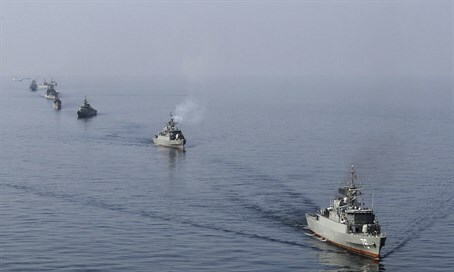 Iran is planning to send a fleet of warships to the Atlantic Ocean in the near future, its Navy Commander Rear Admiral Habibollah Sayyari announced on Wednesday, according to the semiofficial Fars news agency. "Our warships will soon berth at ports in the Atlantic Ocean," he declared while addressing a welcoming ceremony in Iran's northern port city of Anzali for the Iranian warships returning from a voyage to the Caspian Sea and Russian port of Astrakhan. He pointed to the presence of Iranian warships in the Caspian Sea and Astrakhan port, and said, "The presence of Iranian warships in international ports shows the Iranian Navy's prowess." Iran's second fleet of warships, including a home-made destroyer, returned to the country's territorial waters after a voyage to Russia on Wednesday, Fars reported. According to the report, the voyage by the Iranian warships spotlighted an expansion of naval cooperation between Tehran and Moscow. Iran often boasts in its media outlets of its military capabilities, though many times it is unclear whether these capabilities are real or whether the boasting is done to influence public opinion. Two years ago, for example, Iran presented a new fighter jet, claiming it is able to evade radar systems. Recently, Iran held a real ballistic missile test which the United States and France later said violated UN sanctions. The United States, Britain, France and Germany subsequently called on the United Nations Security Council's Iran sanctions committee to take action over the test, saying the ballistic missile was "inherently capable of delivering a nuclear weapon."